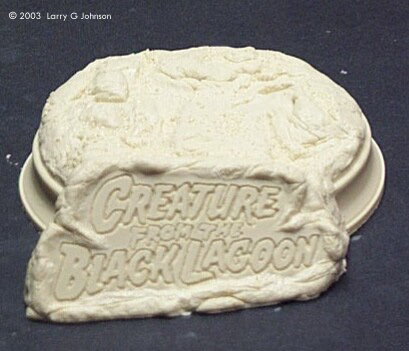 The Creature From The Black Lagoon, or Gilly as we affectionately refer to him, has always been my favorite movie monster and thus I have pursued many different models of him (I'm dying to find the Dark Horse cold cast porcelain one of him swimming). Image: See the bubble in the thumbclaw? The most common model has been the old Aurora kit, which I have built several times as a kid, released again by Polar Lights. 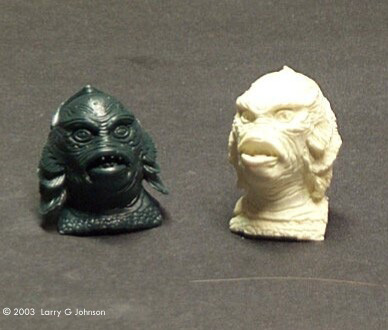 As a more serious modeler, this Gillman kit no longer appeals to me. The model is rough with seams in bad places, places where puttying and sanding ruin the molded scales. The pose is alright, he looks likes he does in the spotlight waving off the bright light, but the head just doesn't look like Gilly. The Aurora head looks too chubby. But with aftermarket parts, the old Aurora kit gets new appeal. The Posthumous Productions kit makes the model worth building. 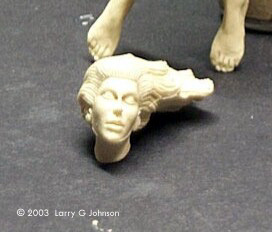 It provides a much more accurate rendition of the Gillman’s head. The kit also comes with a replacement name plaque to cover the writing on the kit base. No instructions are included, the kit comes in a little plastic zip-lock, but it’s not that hard to figure out. Clean up the mold seams and trim the casting plug from the bottom of the neck and it should fit into place pretty well. Alternatively, you can leave the plug and trim the opening in the kit body to accept it. Either way I think some puttying will still be necessary to mold resin head to plastic kit. The mold seams are the worse part. Cleaning them up will take careful work as they cross the finely cast gills. Some reworking may be necessary here. 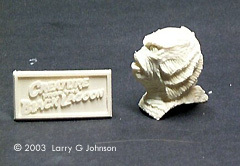 The Jimmy Flintstone kit is not at all necessary to make the Gillman look more accurate, but it does provide the opportunity to modify the kit drastically so that it’s not just the same old Aurora Creature From the Black Lagoon. Inside a sturdy white box, sealed in a baggy and garnished with pretty packing peanuts, are seven yellowish white resin pieces and two business cards. The first piece is a replacement base (I’ll miss that snake and lizard) with a much more dramatic rendering of the movie’s title cast into it. Otherwise it’s not too much of an improvement over the kit base which has a nice rock, a little branch, and the reptiles. The kit then supplies replacement arms for the Gillman so that he can be holding the other 5 parts - Kay Lawrence, as played by Julie Adams. She comes as a body, head and two arms. The kit is cast pretty well but there are a lot of bubbles and mold seams on mine. 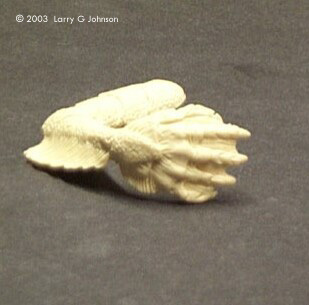 I know we usually have to accept mold seams but on Gilly’s finely cast arms, with all the scales and suckers and fins, it’s hard to clean up and not lose some detail. Cleaning up the girl’s parts will be much easier. Accuracy wise, the Gillman’s arms are near perfect. The girl, with a good paint job, can look like Ms. Adams but I think the kit lips are a bit too collagen-filled. A minor point: her hands are not in a very realistic pose. An unconscious person’s hands will tend to curl up a bit, not lay open flat with fingers tight together. The Flintstone kit doesn’t include any directions (stone tablets would be heavy to ship) but if you have some resin experience, that shouldn’t be a problem. A small business card is provided with some general resin tips. 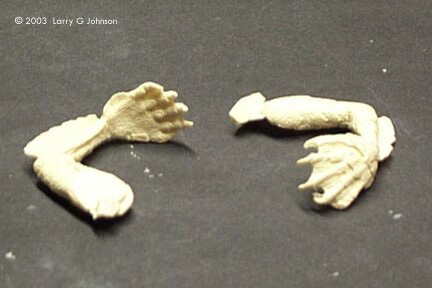 These two kits have made me all excited to build another Aurora (Polar Lights) Creature From the Black Lagoon kit. The Posthumous head really makes a difference in the kit’s appearance and the Jimmy Flintstone kit makes it not the common Gillman. The mold lines are the biggest problem with the kit but anyone with resin experience should be okay with it. I recommend both these kits, and in fact, consider the Posthumous Production’s head an absolute must to building the Aurora kit. I’m not an autograph hound but seeing as Gilly is my favorite monster (sorry Godzilla, you rate number 2), maybe I can get Mr. Chapman and Ms. Adams to sign it if I can finish it by Wonderfest. Many thanks to Larry's wallet for providing the review samples. Manufacturers and retailers, interested in getting your wares reviewed and publicized on a site averaging 3500+ readers a day? Contact us! This page copyright © 2004 Starship Modeler. Content last updated on 6 April 2004.